“What is that feeling when you’re driving away from people and they recede on the plain till you see their specks dispersing? – it’s the too-huge world vaulting us, and it’s good-bye.” – Jack Kerouac, On The Road. The sometimes painful tragedy of the new beginning is the end it brings to what came before it. Leaving Portland closed the chapter of my life that though left in the rear-view mirror of my SUV, will not be erased from my memories and the life changing impact it has made on me – from my personality. What a place. Portland is vastly different from any other North American city. It encourages and inspires one to live ones own life and write one’s own story. It is a giant playground laid out before a man, divided into compartments called neighborhoods, where one can become a new self over and over. All the tools and settings are already there, all you have to bring is inspiration. People of all sorts are waiting around the corner to invade your social world and to enrich your experience of this city that has a vibe of a giant hometown. No one is a stranger here. It can be your first day in town or your fifth year living here, the opened doors and ready friendships are welcoming to all. This is a city of welcomed opportunity of social graces and community. The ones who are isolated, are isolated by choice, not by exclusion. I came here halfheartedly and half-willingly. I was not in love with this city. I came here because it was the only opened door, and I was too passive to look for another. It’s easy to feel your life is in shambles when you have no interest in cleaning it up for yourself. Well, lucky for me this was the city that brought me new experiences I wasn’t even looking for. A lonely heart that longs to forget pain can be at ease here. Portland is not interested in dwelling on your past as much as it wants you to enjoy your presence here. She is like a drunk new girlfriend who does not care that you are broken, she wants you to dance, and laugh, and drink, and live. She demands you live a thrilling life even in your misery. She pools you into this party of a life with its smells, and senses, and lovely people. I don’t know what it is that gives Portland the power over people to forget themselves and become part of this melted swirl of life. Perhaps its the beautiful weather, that leaves one desperately looking for something else to occupy ones brain. Perhaps they all already were these beautiful souls and providence brought them to Portland. Not sure how that is possible. One thing I know, they definitely did not grow up here. 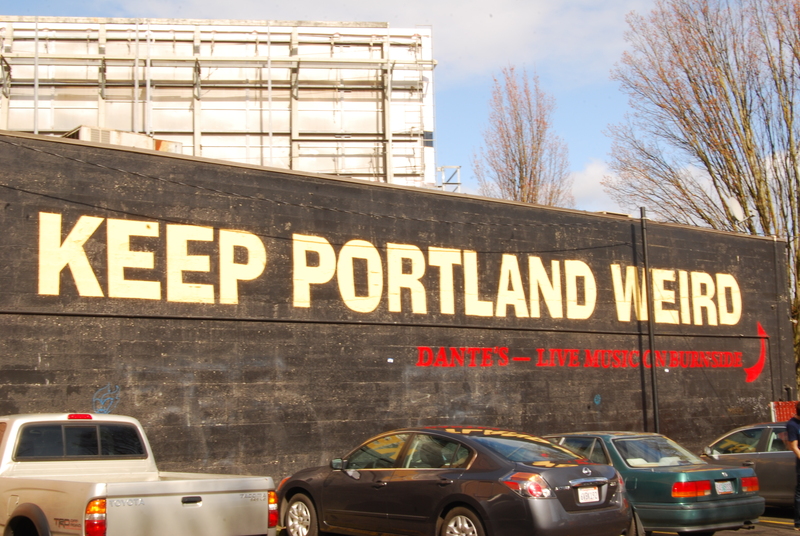 Portland is the city of transplants – it takes work and dedication to locate a native here. Whatever it is that made people in Portland to be who they are, their community alone is what makes this city what it truly is – unique and weird. The awesome vibe of individuality of every spot in this city, the outdoors, and proximity to the volcanoes and the ocean, the delicious food and multitude of choices, breweries, and music – all of that is the added perks that come with it. The friendships and relationships I have built here were unique because It was the city that brought us together. Our relationships were not based on mutual interests, on common ideas and goal, neither did we have a similar background nor a prospect of a similar future. From the start we could pinpoint the fact that we did not have much in common. Despite that, we plunged into these friendships of drinking in each others personality and each others style. It was an overwhelming amount of puzzle pieces that just happen to fit. We drank in each others personality, stories, actions, thoughts, ideas. The beauty of learning to appreciate a person for just being an individual is overwhelming. It’s when you know you are forgiving them being who they are because you chose to love them for them and not for your idea of who they must be. A living community of random friends, neighbors, acquaintances, and semi-significant others that will burn up the time to get the experience and love to the fullest. It will fill up your heart and make you drunk in the moment. A pursuit of making others feel valued and valuable and open-minded devotion to hospitality and showing friendship to strangers. These friendships and relationships are hardly communicated or defined, they are unspoken but understood. I will miss my friends and community in Portland, but it is not the comfort of friendship that I will be missing. The friendships may fade, but my friends will remain in my heart. They have made an impact on me. What I do regret is the opportunities I missed by leaving. The friendships that I know would become even greater if only I have remain here. The amazing people I’ve met who have only become my acquaintances without me getting to know their true self. How I wish I could have had a better chance at all that. It may not be a complete goodbye, for I hope to meet these people again. I believe that our paths will cross again. But my leaving is a change that becomes a wedge driven between us. Time and space can be merciless to friendships. Come what may I have grown through my life here, through our shared experiences, and our adventures in this city. I will never be the same because of these people and if we do ever meet again I may not be the person they once knew but I will be a person who holds the memories of it all dear to him. This entry was posted in Life and tagged Adventure, Change, Friends, Friendship, Life, Love, Memories, Past on March 27, 2013 by Alex.